Ok, so this may sound like an odd title for a wild food blog entry but hang in there! I Think Therefore I Eat is an amazing book in which I had the honour of not only reviewing during the summer of 2018, but I also got the opportunity to write an endorsement which appears in the book. Last week, this must-havebook was officially released by Turner Publishing in Tennessee. The greatest philosophers throughout time were the original foodies. To eat or not to eat? Ok, so that’s an easy question to answer. The question that has become exceedingly difficult to answer is: what to eat? That’s a deep and profoundly difficult question to answer in today’s world. More times than not, all of us wander through a grocery store searching for healthy food choices only to become dazed and confused. Being a fervent label reader is now mandatory in order to try and make healthy food choices; but even then, there are always some ingredient names that leave you perplexed. Martin Cohen has brilliantly captured what we, as consumers of food, need to know. I Think Therefore I Eat is well-researched and in particular I want to mention one of the countless pieces of information he brings to the reader. Azodicarbonamide is frequently used to bleach flour, it is in many hamburger and hot dog buns, and it turns up in many fast food products. On August 9, 2001, the Chicago Tribune and the LA Times reported that the morning commute turned nightmarish when a semitrailer overturned on an expressway. It dumped a toxic chemical onto the hot pavement and releasing clouds of vapour into the morning heat. This toxic substance was highly flammable and caused many to fear the worst. Even residents in three nearby high-rises had to be evacuated. All this happened because of something you may be eating – azodicarbonamide. If you hunger for a fresh taste of food truth then you’ll find Martin Cohen’s I Think, Therefore I Eat will serve up an insightful culinary feast that will nourish your mind. 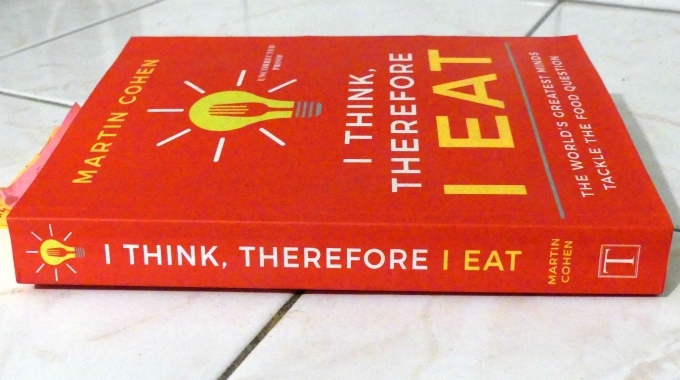 I Think Therefore I Eat is a thought-provoking, incredibly well-researched book that is hard to put down from the moment you start reading it. Cohen presents not just philosophical thoughts, but solid facts from credible sources that are sure to stir up “food for thought” for the reader. This is an insightful, important book that should be read by anyone who is concerned about what they eat. Some of you may be asking yourselves, ok, but what has this book got to do with a wild food blog? This question has two answers. 1) Being a wild food educator I feel it is very important for people to know what goes on in the food industry – after all – all these additives and how produce is grown has a massive effect on your health. 2) As I was reading this incredible book there was a part in which I was humbled – the author discusses purslane and in that segment, lets the reader know about EdibleWildFood.com. This is a book in which I feel is really important to read to get a better understanding of what is going on and why taking time to eat healthy is vital. No one thought to ask the philosophers, those rational individuals devoted to truth, ethics, and reason, what they think – until now. In my opinion, they got the best philosopher. Martin Cohen, BA, PGCE, PhD is a writer, editor and reviewer with an international reputation for explaining complex issues which cut across subject boundaries in a clear and entertaining way. He is Editor of The Philosopher, one of the world’s oldest philosophical magazines. He has also been a contributing writer for The Guardian, The Daily Telegraph and The Independent, and has written many successful books. Love your blog – now I will have to go and buy this as it sounds like a good book. Wow you got to write an endorsement you soooooooooooooooooooo deserve it. Now i have to get this book. My cousin got this book and it is a great read. I think a lot of material in it needs to be known by everyone!